..... Click the link for more information. , class Magnoliopsida, order Magnoliales, family Lauraceae. Tree grows to 75 ft (25m) Alternate simple pointy leaves, shiny on top, lighter and soft underneath with ribs. Small greenish yellow flowers. Fruit is high in monounsaturated fat. (that’s good). The mineral-rich pit can be easily liquified in a Vitamix. The avocado plant is toxic to most animals. Avocado leaves are toxic, do not use them. or alligator pear (Persea), a genus of evergreen fruit-bearing plants of the laurel family. Avocado trees grow to 10–20 m high and have monoecious, almost white blossoms that form paniculate racemes. Their fruits are large dark green or almost black monospermous drupes (length 5–20 cm, weight 250–600 g) that come in several shapes. 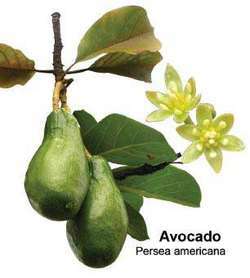 There are about ten species of avocado (more than 20 according to some sources). The Persea armeniaca is widely cultivated. The avocado grows best on fertile, well-drained, neutral or slightly acidic soil; avocado plantings must be protected from winds. The industrial cultivation of avocados is developed in many tropical and subtropical regions of the world, most widely in the USA (California, Florida, and Hawaii) and Brazil. In the USSR there are experimental avocado plantings on the Black Sea coast of the Georgian SSR (Meksikola and Chernaia ptitsa strains). The avocado yields a harvest of 150–200 kg of fruit per tree. Its fruit contains up to 30 percent fat and 1.6–2.1 percent protein; vitamins B1, B2, C, and D, and others; and almost no carbohydrates. The avocado, which is similar in taste to the walnut, is eaten raw, in salads, and in sandwiches. Its cultivation is similar to that of citrus fruit. Gutiev,G. T. Subtropicheskie plodovye rasteniia. Moscow, 1958. Persea americana. A subtropical evergreen tree of the order Magnoliales that bears a pulpy pear-shaped edible fruit. The growth in Mexico's avocado production has been accompanied by more aggressive marketing, particularly in the US and especially during the Super Bowl game. For its part, the planted area will be around 74,000 hectares, of which it is estimated to have 15,530 hectares in avocado hass. Hass avocados have dominated this boom for several reasons: There is a plentiful, year-round supply thanks to imports from Mexico; the variety is relatively easy to ship and sell because it ripens slowly and its thick skin prevents bruising; and the most popular avocado dishes, such as avocado toast and guacamole, have their roots in Californian and Mexican cuisine, so they are best suited to the variety from those regions. There is absolutely room for continued growth in avocado consumption, both in the U. Taking advantage of the growing category and eventually focusing just on Hass Avocados, Harvest Time offered avocado growers in San Diego County packing houses services. Critically, avocado also contains a high supply of other monounsaturated fatty acids (MUFA) and polyunsaturated fatty acids (PUFA). Our findings," he says, "provide new evidence that aroma compounds actually do influence avocado flavor. What makes an avocado delicious? The results showed that adding an avocado to the burger diminished inflammation and narrowing of blood vessels. Researchers recently identified four additional carotenoids (trans neoxanthin, neochrome, lutein-5, 6-epoxide and chrysanthemaxanthin) in the California Hass avocado, which was reported in the October 2009. Spread the avocado thickly on top and add plenty of black pepper. Native to Mexico and Central America, the avocado tree is a variety of evergreen that can grow up to 65 feet tall and requires a subtropical climate to survive. TIP OF THE WEEK: In the front yard, instead of having to painstakingly manicure an unproductive lawn, why not plant an avocado tree or two?